Author’s note: This is a first draft of an article I wrote several years ago about the muCommander file manager. I’m publishing it now because I still believe that muCommander is a good file manager – though I must admit I mostly use Emacs’ dired these days. Reader beware: the tone is a bit rambly. For extra edification about the history and conventions of orthodox file managers, check out the links in the References section. other things I’ll think of as we go along! 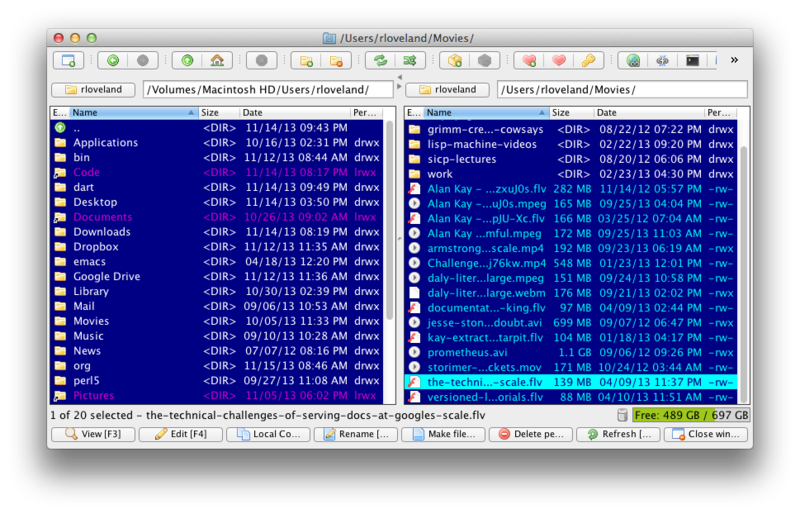 As mentioned above, you may already be familiar with the two-pane “commander” interface to file managers. It was pioneered by Norton Commander, a popular DOS program from the mid-1980s that has spawned many clones over the years. muCommander is yet another of these “clones”, though I hesitate somewhat to call it that, since it is an interesting program in its own right. As you can see when you open muCommander, there are two file windows (or “panes”) containing lists of files and directories. Try pressing “TAB” a few times to switch back and forth between them. You should see your focus change from one to the other, with a bright blue bar highlighting your current file selection. The window you are in at this moment is the “active” window; the opposite is the “passive.” When you are in the active window and perform a file operation such as copy or move, the highlighted file is copied/moved to the passive window. Try this a couple of times, if you like, to see how it works (I recommend copying some files around with <F5> so you don’t lose anything important). Each window has a “location bar” at the top which tells you where you are. To the left of that is a button with the name of the directory you’re in. Try clicking on it and you’ll see that a list of options are available such as other places in your local filesystem as well as network options like FTP, Samba shares and the like (I’m assuming you know what these are; if you don’t, you can read about them on Wikipedia, among other places). OK, so maybe you’ve heard enough preamble already and you want to start moving some files and directories around. Maybe do some copying onto an external drive, or delete some pictures that came out blurry from the digital camera? Great, let’s do it. These are the basic commands. They operate on single files (such as the one currently highlighted), or on groups of files that you can select by tapping the space bar. So for example, if you want to copy three files from the active to passive directory, navigate to each file you want to copy and tap the spacebar. All three filenames should be highlighted in red text. Now press F5 and the copy should begin. You can use this technique for other file operations as well. These should be enough to get you going in your day-to-day use. As you go along in your use of muCommander, it’s often helpful to read the keyboard shortcuts which appear over the various menu items when you hover with the mouse. This is a good way of familiarizing yourself with much of muCommander. Another neat feature of muCommander (and a number of other file managers, I might add) is its ability to store bookmarks of places you’ve been, and would like to go again, specifically directories. These can be local (on your own hard drive), or over the network via FTP or other protocols. For example, you can bookmark the directory where you keep your favorite heavily-annotated plaintext copy of Charlie Stross’s science fiction novel Accelerando, so you can go back to it for a few moments’ reading in your spare time between work emails. This is a silly example, but you get the point. All kidding aside, I often keep a couple of “types” of bookmarks: those directories that I visit most often, such as “Documents” or “Videos”, and a few “temporary” ones that point to directories where I keep what I’m currently reading, or bits of code I’m working on. Please note that as of version 0.8.5, you cannot bookmark files. Open bookmarks list in file manager pane (this allows for file manager operations on your bookmarks collection, such as copying via <F5> (what is it with me and copying? I must do lots of backups). However, I don’t necessarily recommend this unless you know exactly what you’re doing as I recently had to stop muCommander from “copying” an entire open-source-software FTP site onto my Desktop. So YMMV.). As mentioned, you can set up muCommander to display various types of network locations in one of your file manager windows just as easily as it can display local files. This is quite handy, I’m sure you’ll agree, even when you don’t need to copy a whole FTP server’s contents onto your Desktop. Hopefully, you’re smarter than I am, and you’ll no doubt be choosing only a few files and directories at a time to shuffle around. Kidding aside, this is a great feature of the program, and it can be accessed in two ways (that I know of): by clicking on the button to the left of the “address bar” atop one pane of your main window, or alternatively by using the <Ctrl> + <G> keyboard shortcut which will allow you to type in the address of the FTP server (or any other location) you want. One area in which muCommander is still improving is file search (though it does have this ability in a limited fashion, as I’ll discuss below). For example, if I’m focused on a pane of the main window and start to type, muCommander will narrow down into a list of highlighted files which begin with the characters I’ve typed. Example: I have a directory named “Rich,” so I start typing “ri” and the “file cursor” (which is another name for the highlighted thingy we see) jumps to folder “Rich.” Tap Enter, Bob’s your uncle, and you’re browsing the directory. This is extremely handy for super-fast file navigation during your day-to-day usage, and I use it constantly. So be sure not to overlook this feature to add some speed and precision to your movements, as you will be able to literally jump from one directory to another as fast as you can type. As of this writing (using muCommander 0.8.5), however, I cannot search for files using UNIX-style globbing or regular expressions natively within muCommander itself (someone please correct me if I’m wrong on this – see my email address at the top of this document). I can, however, work around this slight limitation quite easily using my command shell, and muCommander provides a nice, quick access to this important feature using <Ctrl> + <R>, as in “Run a command” (easy enough to remember, I think). Once I’ve discovered the file(s) I’m looking for, I can go through and mark them for file operations using the above-mentioned “quick search” feature and the space bar. If there are a lot of these files I want to do something with, sometimes it’s easier to save the search results into a temporary file so that I know which filenames to type for the quick search. As you can see, muCommander can leverage your computer’s existing search capabilities pretty nicely to do what you need it to. You can probably dream up some better solutions to these kinds of problems than I can, but this is a place to start. muCommander is an excellent computer program. Because it is written in Java, it is portable across Windows, Mac, and Linux systems (I say this from experience – I didn’t just read it on the website! :-) It can replace one or more of the other programs that one might usually need: FTP client, file navigator, batch renaming tool, and more. It is truly a wonderful program that can solve many needs, and with a little command customization and study on your part it can be made into a devastatingly effective tool that you can bring with you anywhere (anywhere computerwise, that is – and there’s even a portable version!). This entry was posted in Ancient History, Java, Orthodox File Managers and tagged ancient-history, java, orthodox-file-managers, portable on November 15, 2013 by logicgrimoire.